Until its roads - which James Bond famously drove down in Quantum of Solace – were built in 1932, this north western town in the Riviera dei Limoni was only accessible by boat. No longer secluded, it’s now a popular destination for day trips and holidays. The charming town includes a square, two harbours and a lovely wide promenade that contrasts the narrow back streets. There’s a really lively atmosphere here after sunset where you’ll find people enjoying the late night shopping around the maze of cobbled streets. After al fresco dining on the promenade, the drink to have is the bright orange aperitivo Aperol Spitz - enjoyed by tourists and locals alike. 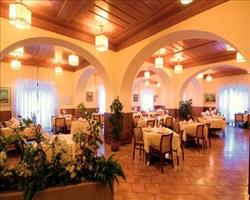 See our pages on Restaurants and Bars in Limone. Ferries and hydrofoils are the best way to get around the lake to visit other towns and you’ll also find a bus serving places like Milan, Brescia and Desanzano. There’s nearly always something on in Limone including late shopping nights, music concerts, village fairs, exhibitions, free guided walks, firework displays on the lakeside and various sports tournaments. For more details about what’s on and when, see our Events page. 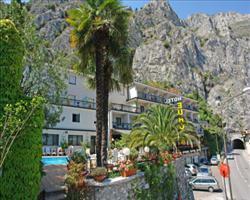 With brilliant wind conditions and challenging mountain terrain, the area is great for active holidays. Windsurfing is a popular lake activity and there are also good walking, hiking, cycling and mountain biking trails around the area - go north to the National Park of Brescia and see the Sopino waterfalls. Some of our holiday options can include pre-bookable windsurfing, dinghy, kayaking and bike options, including equipment hire and lessons. To the south side of town there’s a large beach, perfect for hot sunny days by the lake. Visit our Activities page to find all there is to see and do in the area. The area has some fantastic old architecture as well as a deep sense of culture. There are some lovely religious buildings around Limone - find a path through the cobbled streets to San Rocco Church which was built on the hillside in the 16th century and has a very distinctive onion dome - the frescoes inside are well worth a look. The locally grown olives and lemons have been an important part of life here for centuries, making them well worth sampling in local eateries for a taste of the area. The olive oil co-operative can be accessed by walking through the olive groves and you’ll find fragrant lemon groves and houses scattered in the surrounding hills, well worth visiting for the lemons the size of melons and great views over the town. You can find out more about days gone by on our History page. 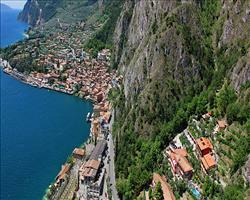 When is the best time to visit Limone? 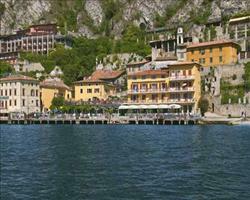 With its position on the northern end of the lake, Limone is accompanied by regular winds which are lovely and refreshing if you’re doing activities on the mountains, especially if your holiday is in July or August when the weather can get really hot here. The town is usually quieter outside the peak summer months, although a few big events on the Limone calendar take place in October including the Lake Garda marathon, adding a great buzz to the town. May’s mild and breezy temperatures are ideal for active holidays. 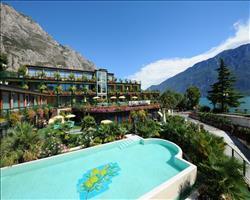 Find out more about Limone in May here. June is usually warm and breezy. For some ideas of things to do and more information about the climate at this time of year, click here. Expect hot weather and 12 hours of sunlight in July – perfect for fully appreciating the views and lake life. Find more information here. August’s sizzling highs of 31°C are accompanied by a refreshing breeze in Limone, find out more about climate and what’s on here. With the school holidays over, September is a bit quieter in Limone and the high temperatures in August have dropped to around 26°C. For more of an idea what September is like click here. October’s mild temperatures make it perfect for mountain sports so it’s not surprising that this is when the biggest sporting events take place. Read more on October here.